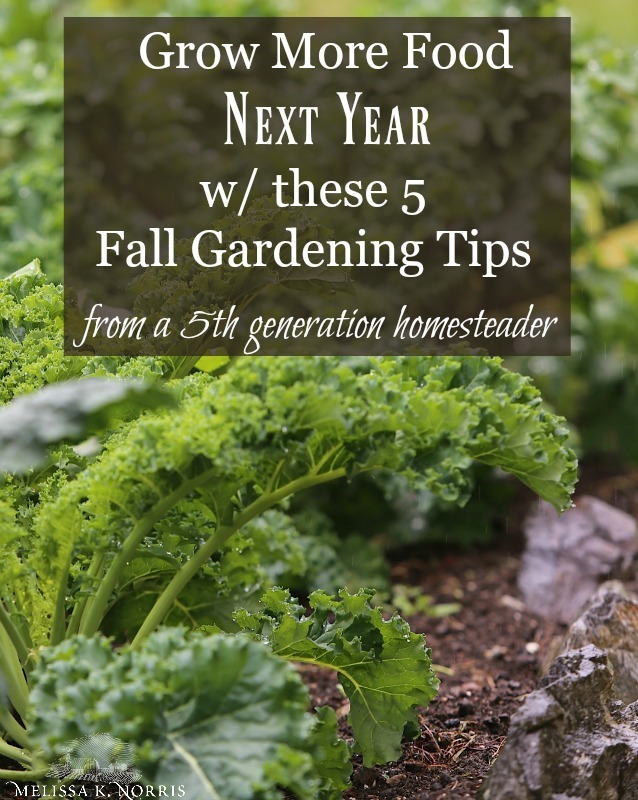 Grow more food next year with these 5 fall gardening tips, yes please. These tips apply if you are doing raised garden beds, container gardening, regular in the ground gardening, or any type of growing your own food, aka, universal no matter where or how you’re growing. Learn how to analyze this year’s garden for better and improved crops and harvest next year. You ready? Listen below to, Grow More Food Next Year w/ These 5 Fall Gardening Tips, Episode #158 of the Pioneering Today Podcast, where we teach families how to grow, preserve and cook their own food using old-fashioned skill sets and wisdom to create a natural self-sufficient home, with, or without, the homestead. This is an unusual year in that we have not had our first killing frost yet, so we’re still bringing in some things where normally the harvest would be completely done, but for the majority of the garden we are in definite fall mode, moving into winter. What is a killing frost? A killing frost is when you get a really good, deep frost that kills off all of your warm weather plants. I mean, everything is obliterated by this frost, so all of your summer squash, tomatoes and such. ***Note with tomatoes: If you are planning on canning your tomatoes, and you know a killing frost is coming, you need to harvest those tomatoes before they go through a killing frost. If tomatoes are left on the vine and they are killed, it lowers their acidity level to that of unsafe for canning. Prior to the killing frost, we’re still bringing in tomatoes from the greenhouse, and we still have a few straggler zucchinis coming on in. We’re waiting for that first killing frost before harvesting our grapes and Brussel sprouts, because that brings out the best flavor in both of these crops. One of the first things we do when it comes to our fall garden prep is to make sure that we do a really good cleanup. For example, I didn’t used to use as much green bell pepper in my cooking, but lately, I’ve been just tossing them into some of our soups and stews, and we really like the flavor. I need to increase our bell pepper plants. We did not have enough this year for me to preserve very many. The plants that I did have produced quite prolifically, I just needed more volume. On the flip side, I planted quite a few jalapenos. I use jalapenos sometimes when I make enchiladas, and when making home-canned salsa. My husband loves hot and spicy, so he will do candied jalapenos, but he’s the only one that eats those. We didn’t use near the amount of jalapenos, so I over planted. I can decrease my jalapeno crops and increase the bell peppers, I’m making note of that for next year. Look at what you planted, how much those plants produced, and then decide what, if any, changes you need to make for next year. Do I need to increase, decrease, or keep it the same? When it comes to seed starting time, and planting the garden, I use those notes and then base calculations off of that. My goal is to not just have fresh eating, but to take that produce and preserve it to last us the entire year, until the next growing season. Now is a really good time of year when you’re coming fresh off the harvest and it’s all right there in your mind, make these notes, and then use them when it comes closer to seed starting, and further in the year. Having these notes handy now expedites the process faster for you moving forward. If you had any crops that were suffering from disease, if you had a lot of blossom-end rot, fungal disease, or blight, then you’re going to want to look at amending your soil and seeing what it could be deficient in. Make notes of certain crops right now, because like I said, it’s fresh. If you had crops that really didn’t produce how you wanted to, or disease or pests wiped them out, make some notes. Quick notes on what happened, and then you have at least a few months this time of year to work on that. Do more research and see what you need to do and when in order to fix those problems. Look back on the harvest and determine if maybe you could have done some more succession planting, or if you should have. What do I mean by that? With our extended growing season, which I said is a little bit unusual for us to be this far into the year without that killing frost, if I had planted some additional zucchini and cucumber plants about two to three weeks after the first plants that I put in, then I would still be having a lot larger harvest on those second planting plants, because our growing season was extended. If you find that you planted all of your plants at one time, and that they were spent before the growing season was over, you might want to look and see if maybe you should have planned a little bit more succession planting so that you had smaller harvests at one time, but longer into the year. This can be beneficial so that you don’t have this huge glut of everything all at once, and then you can take your time preserving, and harvesting it, longer and in smaller amounts. Take notes on your climate. If there’s been any extension or patterns over a long period of time, that may adjust your planting schedule. It may be you get to plant earlier, which means a longer growing season. Hallelujah, but it could be the opposite. Sometimes you can just have an off year. For example, this year as I’ve said, we are having an extremely long growing season which is not normal. This is the first year that we’ve had this, but if over the next three or four years our first frost is pushed back into October, and we don’t get it in September, then with that being repetitive, it starts to feel like it’s kind of the new norm. I would not make changes based off a weather pattern for just one year. I’m talking multiple, multiple, multiple years in a row, but if it looks like it has changed and it’s going to stick around, then I would evaluate. We’re going with our fifth really dry summer, and it’s pretty much a holding pattern now. So knowing that, I am not keeping peppers, and my heat loving things like basil, in the greenhouse anymore, with the exception of my tomatoes to avoid blight. I do still look at the weather, and I’m cautious with putting out my stuff too early, but that’s been the pattern five years in a row. I still keep an eye on the forecasts. On what is predicted and go by that each year. But you may notice a change in your area and should adjust your planting accordingly. Then lastly, take note of where everything was in order to practice crop rotation for next year’s planting. If it’s still visible, take a picture with your phone. You’ve got it on there, so then when you go to plant this coming spring, you know where you need to practice your crop rotation. If you already did it in the springtime, then you don’t need to worry about it now, but for those of you who forgot, or you just didn’t know, now is a good time to do that if you didn’t do it earlier. I want to thank you so much for joining me on this episode of the Pioneering Today podcast. I hope you have an amazing week. I hope you found this helpful, and I hope that you come back and join me again next week.